In most premises liability cases, such as slip-and-fall injuries and swimming pool drownings, victim/plaintiffs must establish both negligence and knowledge in order to obtain compensation. But dog bite injuries work a little differently. Florida is one of the few states that has a strict liability law. But the Sunshine State’s law is rather unique, mostly due to the plain language in the statute. It only applies to “dog” bites. That limitation is usually not a problem. The vast majority of animal attacks involve dogs. We see the occasional snake bite case, but they are somewhat rare. More troubling, the strict liability law only applies to “bite” injuries. Many times, especially if the victim is very young or very old, the broken bones, head injury, and other knockdown wounds may be more serious than the bite. Moreover, it is sometimes difficult to trace noneconomic damages, such as pain and suffering, directly to a bite. How can Florida victims best use the strict liability law, and other legal theories, to obtain justice and compensation? Negligence: If any person failed to use reasonable care in handling or dealing with the animal, that person may be liable for attack damages. Negligence claims do not just apply to the owner. For example, if a daycare teacher does not stop his students from petting a strange dog, the day care may be liable for damages if the dog attacks a child. Scienter: This is the Latin word for “knowledge.” If an owner or custodian knows that the animal is potentially dangerous, that person may be legally responsible for damages. Evidence of knowledge includes not only prior attacks against people or animals, but also behavior like snarling, aggressive barking, and baring of teeth. Negligence Per Se: Most jurisdictions in Florida have very specific leash and restraint laws. If the owner or custodian broke one of these laws, and that violation substantially caused the victim/plaintiff’s injuries, the tortfeasor (negligent actor) may be responsible for damages as a matter of law. Sometimes, however, negligence per se is only a presumption of negligence. Third party liability may be available as well. In the negligence example above, the daycare is responsible for damages, and not the individual tortfeasor, because of the respondeat superior doctrine. Other third party liability theories are specific to dog bites. For example, if a landlord prohibits certain types of animals and a prohibited animal attacks someone, the landlord may be liable for damages. The assumption of the risk defense is deeply embedded in Florida dog bite law. 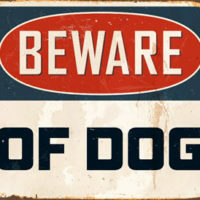 Typically, a “Beware of Dog” or similar sign only raises the possibility of this defense. The insurance company must still prove the elements of this defense by a preponderance of the evidence. But in the Sunshine State, if the owner displays such a sign and the attack occurs on the owner’s property, the owner is usually not liable for damages. That immunity applies even if the owner knew the animal was dangerous. Dog bites and other animal attacks often cause serious injuries. For a free consultation with an experienced personal injury lawyer in Brandon, contact Reed & Reed. We have four area offices (St. Petersburg, Lakeland, Tampa, and Clearwater).